Clicking in the rain can be a tricky, yet one of the most rewarding tasks, especially if you are looking for a family portrait. Though it may be somewhat nightmarish initially, but if few points are taken care of, the photographer in you will absolutely love the results. It goes without saying that in terms of outdoor shoots, clicking in the rain is far more challenging than shooting in dry weather. You have to think about saving your cameras and gears from water, to save yourself and others from getting drenched and most importantly, to calculate the light and aperture right. But a few preparations, you would be rolling on the cameras for the results that you will be forever proud of. Model photographers have a tough task during outdoor shoots, particular in the rain. Below are some tips to follow. Pack your gear right: This is by far the most important step that will take care of most of the rain issues. Make sure you have the necessary items to shoot in the rain that will include protective gear for your camera and other accessories, bags, umbrellas, tripods, silica gel packs to draw out the moisture from the wet items in the bags, towels et al; and if possible, a few extra pieces of clothing too. Calculate the light, right: Rains dim the sunlight and therefore, make sure that the shots are not too dull or dark for want of more light. Calculate the right amount of light that you would require, and adjust the lighting likewise. Too much of brightness also brings the problems of shadows; make sure that do not have any unwanted silhouette lurking in the frame. Place the light right: Not only the amount of light that you require, but also its placement is also of extreme importance to you. The back lights, front lights, cross lights, placement of the models, all go a long way in defining your shot. Adjust the aperture: Adjust the aperture right, whether for landscape shots or portrait ones. You may have to spend some time at this. Let your creativity flow: Do not let the rains daunt you; rather make the most of it. Whether for capturing the rain drops in the background or its effects on the objects like wet hands, flowers etc, go with the flow and be on a clicking spree. You never know; one of these clicks may even surprise you with its sheer brilliance. Do not forget to capture the emotions. 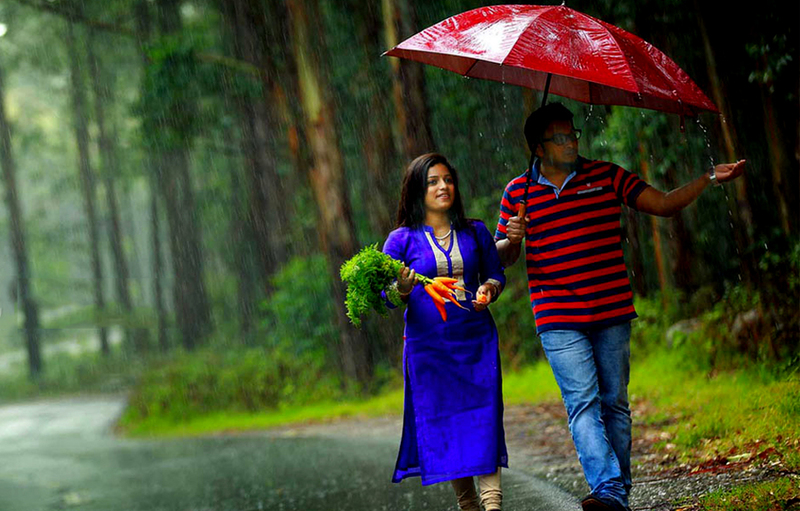 Rains can bring forth the child in any adult, and a deluge of emotions. Baby/kids photographers can create wonders with rain. Do make sure that you get some of these raw unhindered emotions captured in your camera, other than the precisely directed shots.